I have Allie to thank for saving my (blog) life. My computer kept telling me my start-up disk was full, so I got out my external hard drive to transfer files and then delete them from my laptop. It took over 30 minutes to transfer all of my photos, and then my start-up disk was STILL full! I didn’t get it. So what to do when you’re completely lost and hopeless? Turn to twitter. So restart I did and now everything works wonderfully! What would I do without twitter and blends? Not be writing this blog post, that’s for sure. This morning saw an early wake-up call for a volunteer event with friends from work. 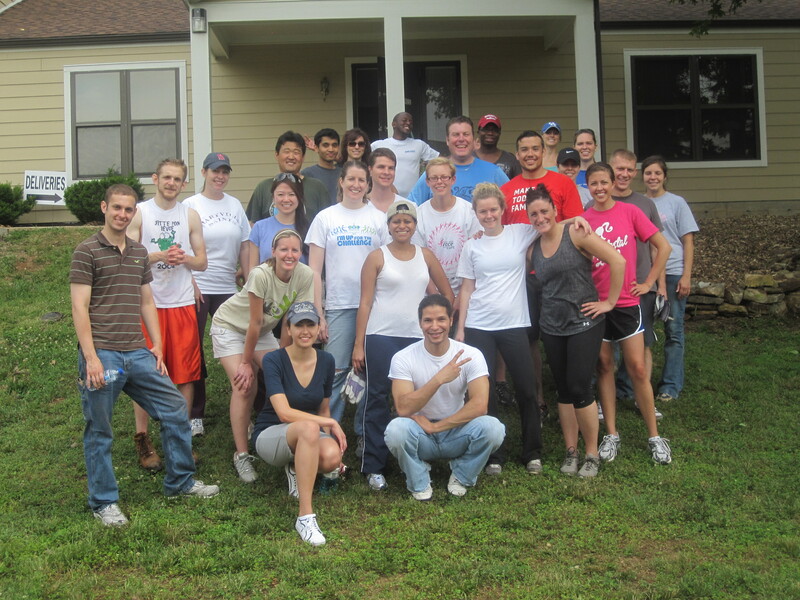 I volunteer with GenNext, the young professionals portion of the United way. Usually my company does services projects on our own, but today we joined forced with people from Monsanto and Edward Jones to do a little service/networking combo. I *safely* ate a jar of overnight oats on the way there. 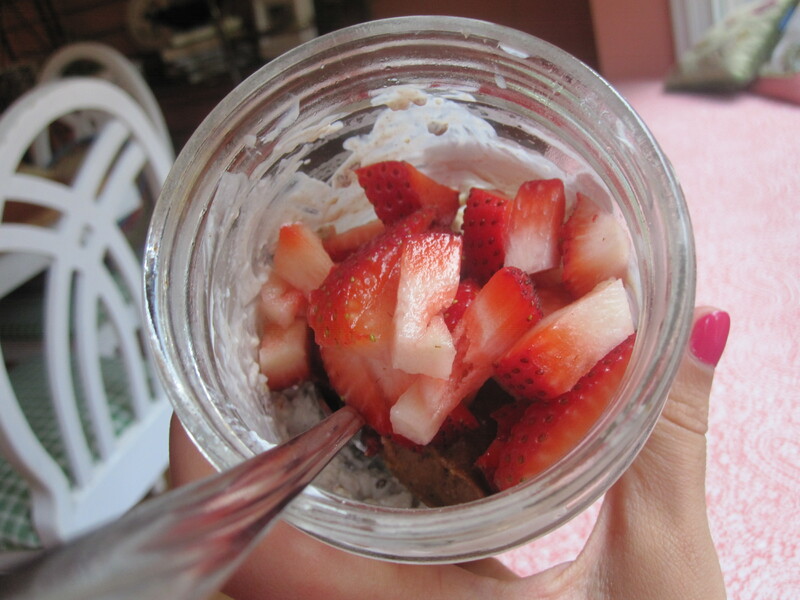 My usual Greek yogurt/oats/chia seed/banana combo with almond butter and strawberries on top. We ventured out to Eureka, MO (almost to Six Flags!) 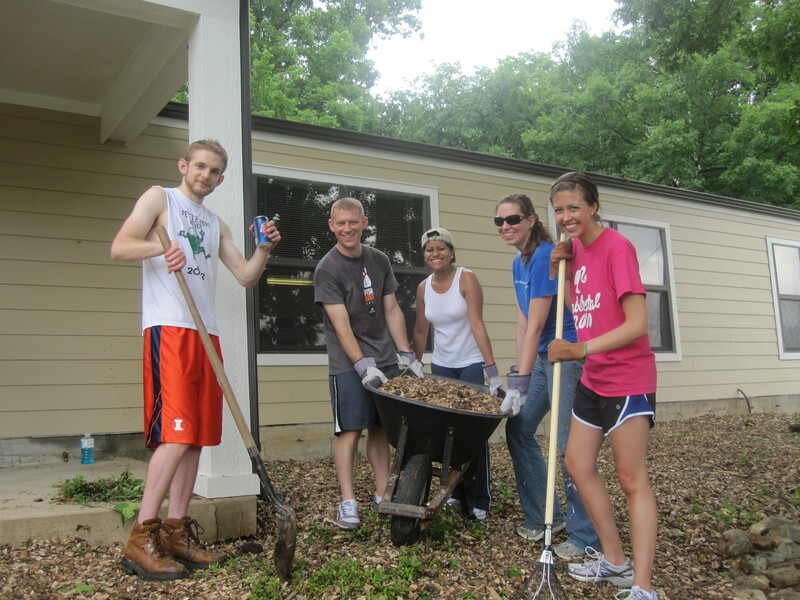 to do some landscaping work for Camp Wyman, a team building and leadership camp for tweens and teens. I spent the morning mulching, but tasks included painting and rebuilding rock retaining walls. We were rockstars and finished the work in 1.5 hours instead of 3, so we spend some extra time weeding and chatting before hitting the road early. It was great to meet some other young people in St. Louis! Once home, I made myself a quick lunch before heading to meet friends. My mom made a bunch of Mexican themed dishes for a party last night and had leftovers, so I made a salad out of my favorite black bean and corn dip. 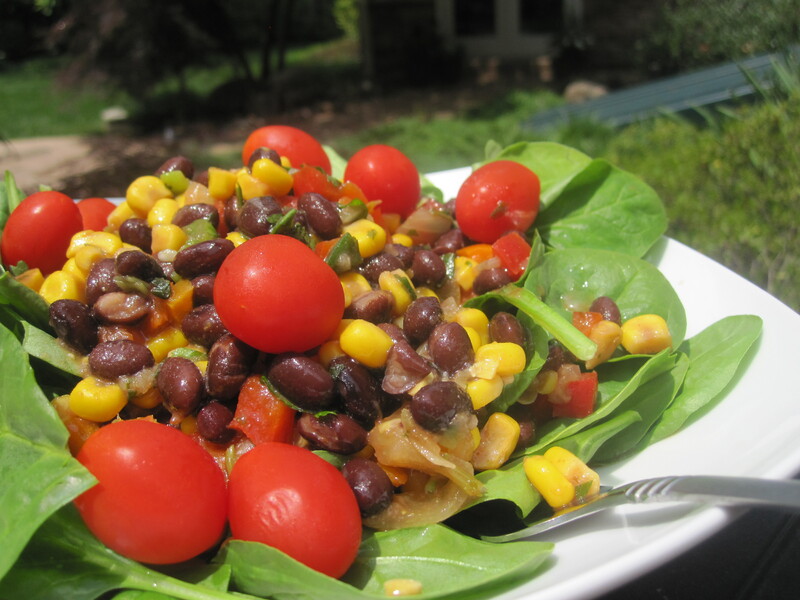 She doesn’t use a recipe – it’s just a bunch of corn, black beans, chopped bell peppers, cilantro, and lime juice. Incredibly addictive and despite being a dip, it’s perfect on it’s own. I had an orange as a sweet ending and then headed to a friend’s pool. A bunch of us chatted, drank a few beers, snacked, and played with the most adorable new puppies! That’s Mufasa. He’s 8 weeks old and still afraid to go down steps. TOO CUTE. 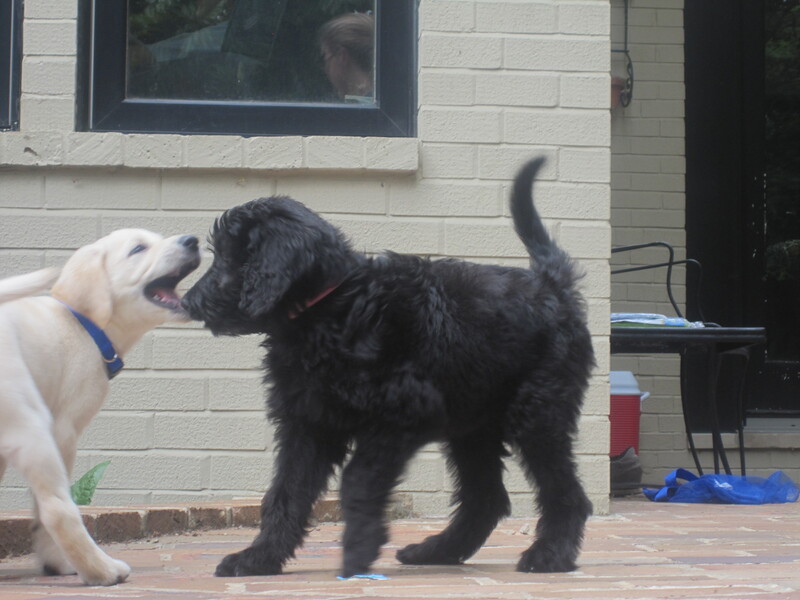 And when he plays with the other new puppy, Noche, it’s irresistible. I want a new dog! My afternoon eats included bunches of crackers, chips and salsa, and two mini lemon cupcakes that I brought from my mom’s leftovers. Lemon desserts are dangerous – they are so light and fresh that it’s easy to keep going back for more! 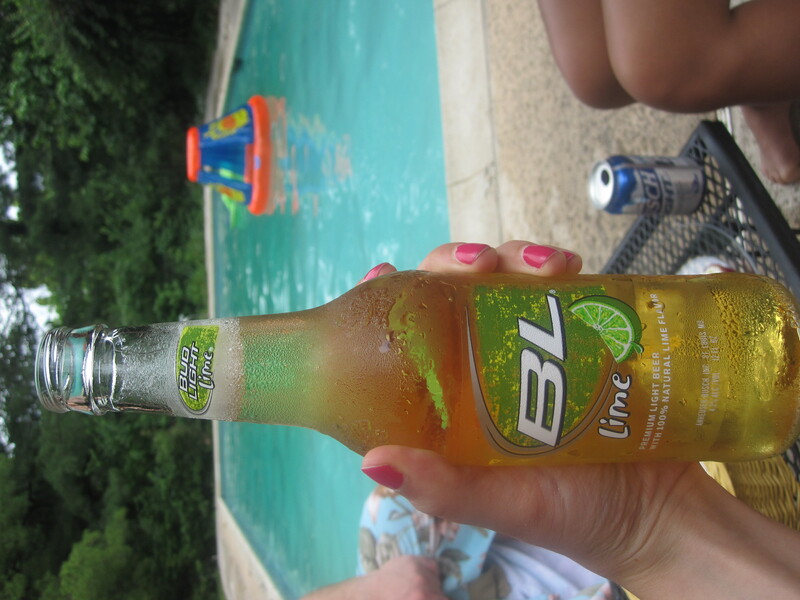 I also enjoyed a Bud Light Lime. The rest of my day took an unexpected turn when I found out a friend from college, Casey, was in town! She JUST found out she might be moving to St. Louis for a new job and wanted to get a tour of the different areas she could live in. Maggie and I drove her around the Central West End, Soulard, Benton Park, and Washington Avenue talking a mile a minute and probably confusing her more than anything. I totally feel her pain though – trying to figure out a new city is stressful! Even though I’m moving away, I hope she ends up here! It’d be nice to have her when I come back! I didn’t get home til almost 7 and plans for the night were jumbled. Dinner plans with the girls got canceled and no one knew exactly what they wanted to do. Being a planner this drives me crazy! I took a shower, started laundry, and snacked on strawberries and chocolate chips while waiting for things to get settled. Just when I thought I was seeing a movie, people decided to go to someone’s house instead. At almost 10pm and with my 7am wake up call for a run with a friend, I decided just to stay home and deal with this picture issue. I’ve had some veggies and hummus, a few almond butter spoonfuls, and another dip into the chocolate chip bag but now I’m ready to dive into bed. My sheets were included in that laundry I started….is there anything better than tucking yourself into freshly washed sheets?? OKAY that was long, sorry! See ya tomorrow! Bahahaha glad I could help! Mufasa is adorable! I want him!! thank god for twitter! Lol. I feel like I will have a lot of questions now that I started a blog! It is kind of confusing at first I think! Mufasa is so cute! I have the worst puppy fever! Hahaha I love the blogging community and how there’s always someone out there who can help! ohhh..fresh sheets. i forgot mine when i went to my parents…so i have cat fur on mine. booooo. omg I need a puppy like Mufasa in my life! Mufasa is SO FREAKING CUTE! I want a puppy! And sleeping in freshly clean sheets is one of my all-time favorite activities ever. I love your swimsuit!! Where is it fun? Cutest puppies ever! Freshly washed sheets are the best!! I am a planner too and don’t always do well with spur-of-the-moment plans. Clare, who’s puppies are those? Great stuff! What a cut puppie and tight tummy! Clare, your swimsuit is soo cute! Where did you find it?